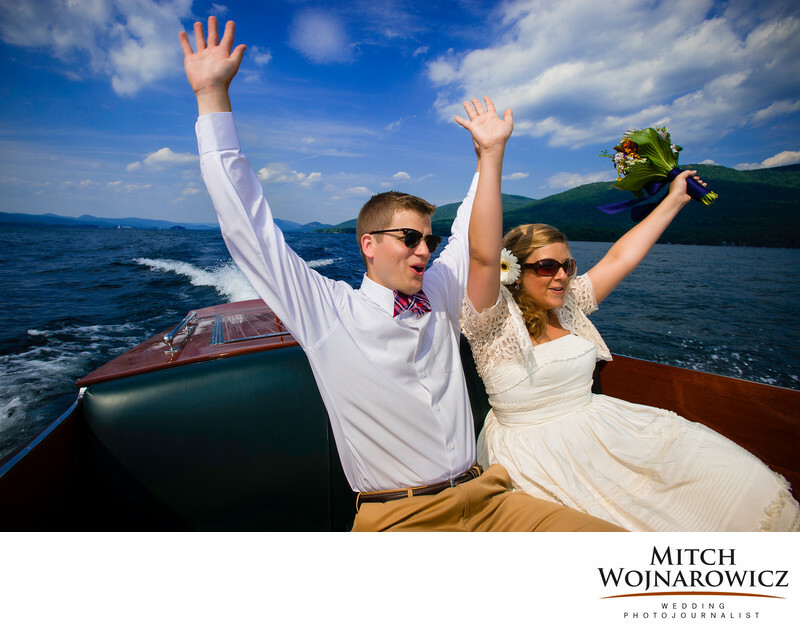 In an antique wooden speed boat, a triple cockpit barrel back Cris Craft to be exact, Laura and Mike excitedly leave their Lake George wedding ceremony. Throwing their hands in the air and happily shouting as they are taken away on Lake George in the Adirondack Mountains of New York. As an Adirondack wedding photojournalist, I’m alway on the lookout for unscripted images and moments such as this. To be sure, as I perform documentary wedding photography, I’ll also be photographing the things you’d expect covered at a wedding. Taking the lead and directing you when needed. But these sorts of images are the ones that will end up on your wall, both now and treasured forever. They aren’t just candids. They are moments of your life. Real ones, ones that produce more than ordinary wedding photography. Ones that produce images that excite me when I capture them and ones that will delight you after the wedding and as the anniversaries roll by. OK, let me explain. You have the beautiful pristine Adirondack Park surrounding the deep mountain lake. The sun and the sky and the water and the, well, feeling you get from being in that environment. The entire sense of place that you have from being in, on and around the historic area of Lake George adds such a depth and dimension to any wedding. After all, anybody can have a wedding just like everyone else in a banquet hall. But those who opt for the lake get rewarded with an environment, the light and a background which will make for incredibly beautiful wedding photos. It all centers on the natural beauty of the place. And how that natural beauty provides the opportunity to make great wedding photos. Cruising in an antique boat in the summertime for your wedding can make for some outstanding photos. Boats can often be rented, with advance planning, from one of the marinas in town. Some will come with a captain to pilot you around on your wedding day. Keep your options open when you consider what makes a great wedding photo idea. Not everything has to come from check list in advance. With a wedding photojournalist spontaneous fun wedding photos can happen with just a little pre planning. Since I’m a Lake George NY wedding photojournalist, I get to work in a stunning natural environment as I work to create unique wedding photos which focus on who you are and not who I think you -should- be. Plenty of advance planning allows me to work alongside you as your day flows in a very organic way. Sure, there will be a couple of smaller lists. But the photos from those lists won’t make up the bulk of the wedding photos you end up with. You’ll more beautiful versions of the photos you’d get from any photographer. And then, on top of that, you’ll get the great natural moments like this one. Could We Speak About Your Lake George NY Wedding? I won’t bug you nor will things get turned into a big sales session. As a wedding photographer with deep experience, I can offer so much guidance and offer questions which will help you think about and clarify what you are looking for in an Adirondack wedding photographer. There’s no catch. I just lovesoharing my experience, helping people begin the complicated process of finding a Lake George wedding photographer. Just Click This Link To Start The Process. Keywords: adirondack (60), LakeGeorge (6).